You land at a busy airport, and struggle to find your way to the passenger pickup area. You finally arrive, only to be confronted by a row of drivers, standing next to nearly-identical vehicles. You walk out of an office building on a busy New York street and see a black sedan pulling up to the curb. The horns honking behind you and the flow of the busy sidewalk disorient you as you hop in – only to realize you’ve inadvertently jumped in to a horrified person’s private vehicle. You step out of the door of your hotel and are greeted by a smartly dressed man who tells you, “I’m your driver.” As he pulls away from the curb, you glance at your reservation details and realize your current driver isn’t a match. In ground transportation, a “service deviation” occurs any time the service delivered fails to live up to customers’ expectations. Curious to know one of the best kept secrets in the world of chauffeured car service? The #1 biggest cause of service deviations is missed or complicated connections. There is no bigger moment of truth in ground travel than the initial meeting between driver and traveler. At the very least, challenges here lead to confusion, frustration and unnecessary delays, often at the beginning of a very important day or at the end of an already long one. Travelers may even break down and resort to finding a taxi or calling an Uber, defeating the entire purpose of arranging a car service in the first place. But service deviations at driver meetup can also be a huge safety concern for high-end travelers. Unfortunately, hectic passenger pickup zones – like the situations described above – are target-rich environments for a host of bad actors. Is being abducted while trying to meet your driver a worst case scenario? Of course – but it’s also not unrealistic. Meeting a driver doesn’t have to be this difficult. Familiarize yourself with these best practices, and share them with any executives whose travel you manage. Crime is never random; it is perpetrated against those deemed by criminals to be particularly valuable targets. Minimize your risk by making yourself a less easy target. Being visibly alert in your surroundings. Taking calls or checking email on your phone while walking through the airport distracts you from potential risks around you. Paying attention to those around you. Scan the area around you as you’re walking to meet your driver. Does anybody seem out of place? Do any situations catch your attention? Maintain a relaxed alertness of the scene around you. Avoiding looking lost. If you aren’t sure where you’re going, step into a restaurant, shop or restroom to pull up an airport map on your cell phone. Don’t reveal your disorientation to others by looking around confusedly or stopping to review airport signage. Before travel begins, ask your ground provider for any airport advisories that may affect your trip. Given the number of itineraries these services book, they’re often tuned into changing conditions on the ground that may affect standard traveler pick-up arrangements. It’s also a good idea to ask if your ground provider recommends using a greeter to facilitate the traveler-driver meeting at the airport. This is especially valuable at airports where drivers must wait in an off-site lot for travelers to arrive. In these situations, greeters can be available for the initial meeting, while also helping guide the traveler seamlessly through the airport’s pick-up protocols. Finally, don’t rely on driver signage alone to connect with your vehicle, as this could be spoofed by a bad actor (many travelers book under a pseudonym or use confidential keywords for this very reason). This process has several built-in safeguards. For instance, a criminal with malicious intent will not be able to provide the driver name or vehicle details you’re expecting. Just be cautious to use open-ended questions when positively identifying your driver. Stating the expected name – “Are you so-and-so?” – gives away valuable information unnecessarily. 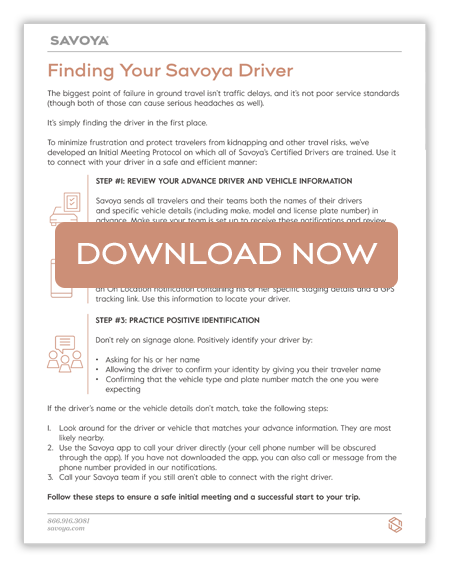 All of our drivers have been trained on this security protocol, but even if you aren’t traveling with Savoya, you can use a version of this process, depending on the advance information you have. If you aren’t confident you’ll remember it in the moment, click the button below to download our free one-page guide to “Finding Your Driver.” Use this helpful cheat sheet to refresh your memory before a trip or to print out as part of the travel brief you provide your executive in advance of their trips. Technology has solved plenty of problems in our lives, and meeting prearranged drivers may be next. Many ground providers now offer mobile apps that can pinpoint driver and traveler locations through GPS tracking. And since direct communication between traveler and driver can be the best way to facilitate a smooth meeting, many of these apps also offer easy, anonymized communication through text or voice call. In addition, text updates noting when drivers have arrived and where they will meet travelers have also become standard offerings for high-end car service providers. Don’t underestimate how much these tools can help in the moment. A simple call or confirmation message could have prevented each of the situations described at the start of this article – and it could help you avoid confusion on your next ground trip. Have you ever gotten into the wrong vehicle? Or have you experienced other challenges in the initial moment of truth of meeting your driver? Leave us a comment below sharing your experiences.